Trust In Yellow would like to apologise to all those supporters who were booked on the coach to FC United of Manchester today. We appreciate what a great disappointment and inconvenience the non arrival of the coach was to all concerned for which we are very sorry. Obviously it was no fault of the Trust that the coach broke down but nevertheless at our Board meeting on Tuesday we shall be discussing what lessons are to be learned and what the Trust can do to prevent this situation arising again. Trust in Yellow would like to thank all those who walked, contributed and supported the sponsored walk to the match at Chorley on Boxing Day. The initiative raised £727.95 and £250.00 of the proceeds will be issued to Clatterbridge Cancer Centre. Jason Gilchrist has been voted the Trust in Yellow Player of the Month for December. Gilchrist, who signed for Southport from FC United of Manchester in November, scored four goals during the month, including a hat-trick at Tamworth. The striker has impressed with his clinical touch in front of goal and came out on top in the supporters' poll. 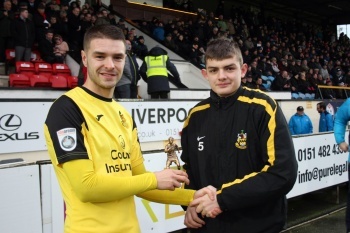 He was presented with his award ahead of the New Year’s Day win against Chorley by supporter Conor Hartwell. Earlier this month, a meeting was held between representatives from the Trust in Yellow Board and Directors from the club. A summary of the meeting is online HERE.